Ownership, staff, and facilities have changed, but the Funeral Service started by Mr. George Murison has been in continuous service to Portage and the surrounding area for over 150 years. Founded as Murison Furniture & Undertaking in 1853, its successor, Pflanz Mantey Mendrala Funeral Home, is one of the oldest businesses in the State of Wisconsin. In a day when many Funeral Homes are owned and operated by large, out of state corporations, the Pflanz Mantey Mendrala Funeral Homes are owned and operated by Jeanne Mundt, Charles Mantey, and Robert R. Mendrala. Jeanne continues as Secretary/Treasurer, while Charles and Robert both continue as Funeral Directors. The three have worked together for over 30 years. 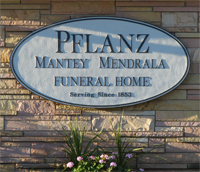 The Pflanz Funeral Homes were renamed Pflanz Mantey Mendrala Funeral Homes in 1995. In addition to Jeanne, Charles, and Robert, Pflanz Mantey Mendrala Funeral Homes staff also includes Funeral Directors, Heather Mundt Smith and Jenna Krenz. Staff members, Nancy Hibbard, Jeri Sutter and Martin Genrich assist in numerous areas. Jeri is a certified grief counselor who also serves as Aftercare Coordinator. All are Portage area residents. The addition and remodel of the Portage Funeral Home was completed in 2002, doubling the total area available to the public. Two identical chapels are now available. In addition, the Poynette Funeral Home has recently been remodeled. Both facilities are ADA compliant. Pflanz Mantey Mendrala Funeral Homes are proud to be locally owned and operated. We consider it an honor to serve the families of the Portage and Poynette areas, providing all types of Funeral Service. We enjoy calling this area “home”.